In a market fraught with increased volatility and puzzling responses to strong earnings reports, it's becoming harder to know where to put money to work. In his "Off the Charts" segment on Mad Money Tuesday night, Jim Cramer checked in with Bob Moreno, publisher of RightViewTrading.com and a contributor to Real Money, to get a better sense of one sector that is seeing growing support: Defense. They started by looking at Boeing's (BA - Get Report) chart. The biggest name in aerospace holds a dominant place in the passenger plane market, but also has tremendous exposure to the defense market. Shares rocketed 130% from February of 2017 to the peak earlier this year. 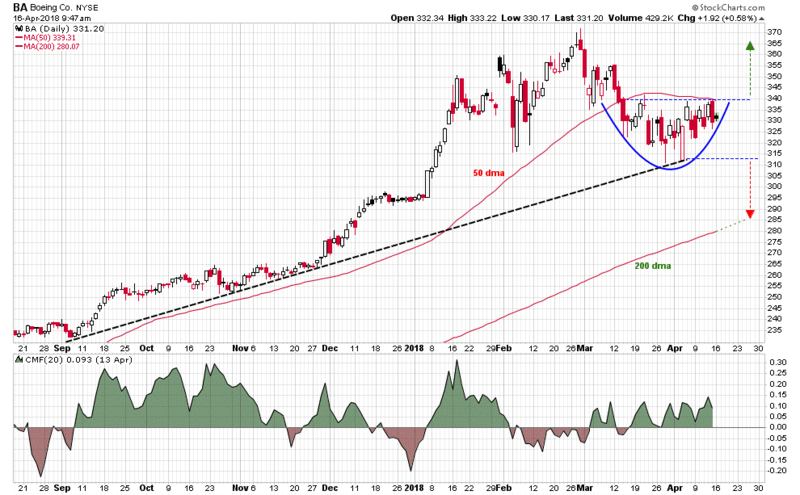 Since then, the stock gave up 15% before finding support at its 6-month uptrend line. Moreno points out that Boeing ran into a ceiling of resistance at its 50-day moving average. More importantly, he thinks that the stock has now made a rounded bottom pattern, and according to Moreno this kind of pattern can help you predict where it might be headed. You take the height of the rounded bottom, add it to the ceiling of resistance at $340, and get a potential price target in the high $360s. 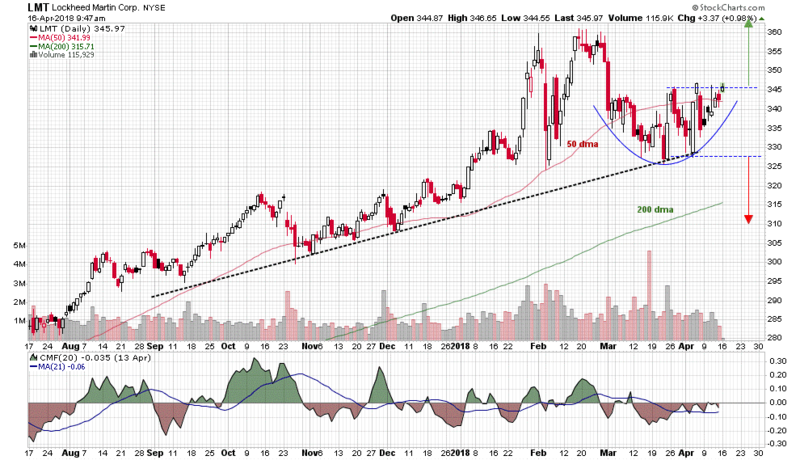 On the other hand, if Boeing breaks down below its floor of support around $313, this same pattern means it could fall as low as $285, potentially turning the uptrend into a downtrend. Moreno believes there's good reason to be positive here, thanks to the Chaikin Money Flow oscillator, which measures the level of buying or selling pressure in a stock. This is in positive territory, and Boeing is only a few points away from breaking out to the upside. If the stock can rally another $5, Moreno thinks the next $25 could be smooth sailing. Cramer and Moreno next looked at Northrop Grumman (NOC - Get Report) . Shares have behaved better than Boeing amid concerns over a potential trade war with China. The stock sold off with everything else in February, but quickly bounced back to new highs. For the past couple of months, the stock has been trading sideways between $336 and $359. Now, Moreno's methodology here is to look at the height of the channel, then use that to come up with a projection of where the stock might be headed. On a breakout to the upside, he could see Northrop Grumman going to $383, up $32 from where it's now trading. On a breakdown, though, it could sink to $312. In Northrop's case, Moreno focuses on the Aroon Indicator, a tool that tracks new highs and lows over time to identify early trend changes. In late March, the Aroon indicator made a bullish crossover, where the green line goes above the red one, and that makes Moreno think that Northrop Grumman is poised to rally here. 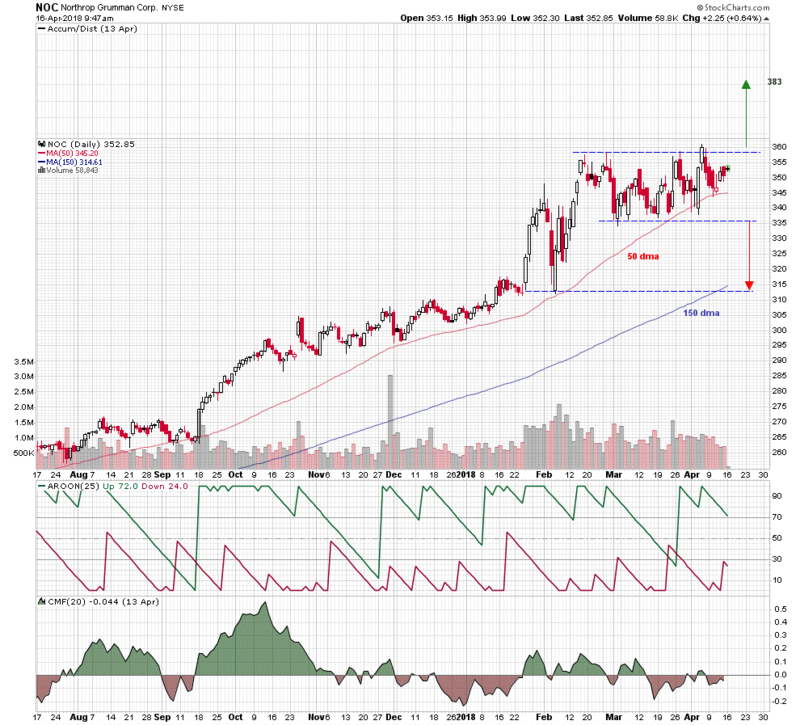 Next Cramer and Moreno examined Lockheed Martin's (LMT - Get Report) daily chart. As with Boeing, Lockheed saw a big rally that peaked earlier this year. Shares sold off before forming another rounded bottom. Lockheed's floor of support here is its 6-month uptrend line, while its ceiling of resistance is just above the 50-day moving average. Moreno sees some nice upside on a breakout, but meaningful downside if the stock pulls back to its floor of support and that floor fails. The Chaikin Money Flow is neutral. If it rallies another dollar that will be enough for the breakout Moreno's looking for. If Lockheed can't break out to the upside, though, he thinks it's very likely it could keep trading sideways for a while longer. Cramer and Moreno also looked at General Dynamics (GD - Get Report) which peaked in early March, before starting a downtrend until Tuesday. Last week, General Dynamics fell to the lower end of its channel, but then it bounced right to the high end, and Wednesday it firmly broke out above the high end of this channel. The stochastic oscillator, which is a powerful momentum indicator is making a bullish crossover, and based on today's move, Moreno thinks General Dynamics can return to its old highs at $230. 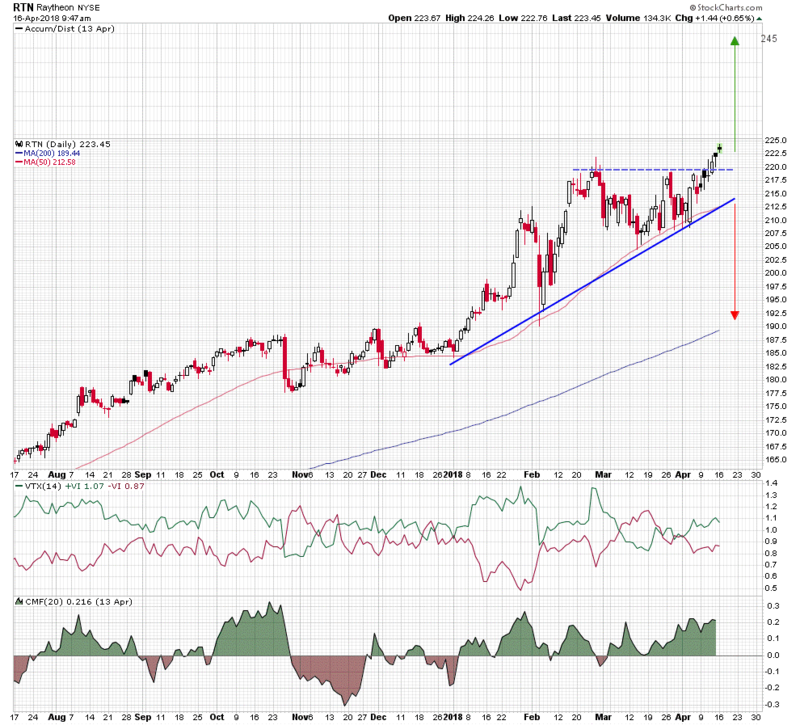 Finally, Cramer and Moreno looked at the daily chart of Raytheon (RTN - Get Report) , which Moreno sees as the most bullish chart in the group. The stock had a small period of consolidation in March, but in the past few days it has definitively broken through its ceiling of resistance. 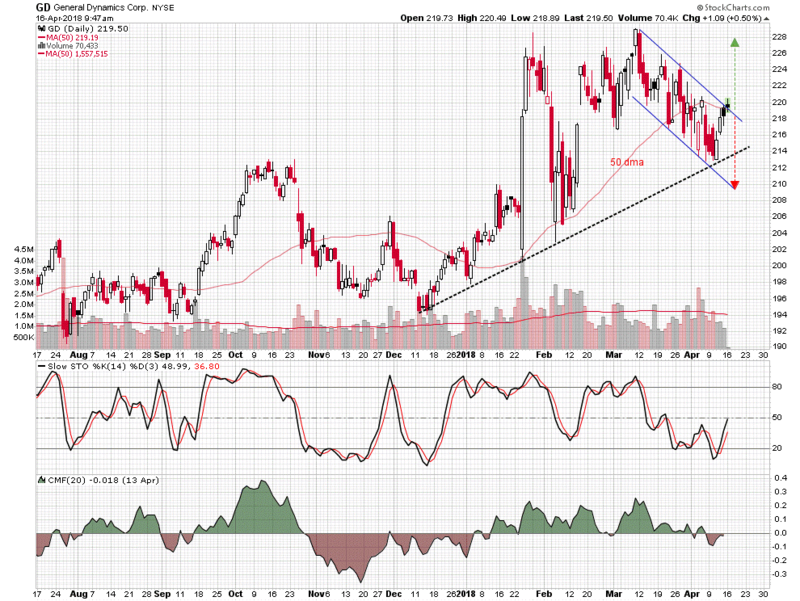 Moreno thinks Raytheon could have a lot more room to run because it just broke out of a rising triangle pattern. He could see it rallying to the $245 area, up $20 from current levels, before this move runs out of steam. The Chaikin Money Flow is also very strong, meaning big institutions are buying. Over on Real Money, Cramer says the Netflix numbers show that cord-cutting is more than palpable. Get more of his insights with a free trial subscription to Real Money. Cramer and the AAP team say that the president's moves on behalf of Boeing (BA - Get Report) signal good times for defense names, including Raytheon (RTN - Get Report) . Find out what they're telling their investment club members and get in on the conversation with a free trial subscription to Action Alerts PLUS.